It is with deep sadness that we announce the passing of Patricia (Pat) Mueller on Monday, November 4th at the age of 64. After a brave and fierce battle with cancer, Pat passed peacefully with her husband and children at her side. Pat leaves to cherish her memory her loving husband, Peter, her three children, Philip (Dianne Wilkins) of Calgary, Lisa (Corey Sadlemyer) of Medicine Hat, and Sara (Brett Anhorn) of Calgary; she also leaves her treasured grandchildren, Anna, Thomas (deceased), Kenna, Turner, Nora and Eli. Her family was her life, and she will be so profoundly missed by all of them. Pat was intensely proud and protective of her children, their spouses and her grandchildren, and was forever devoted to their health, happiness, and success. Her roots in Philadelphia remained strong, and her sister, Ginny (Rick Kremer), along with her nieces Kim and Chris, as well as numerous other special family members and friends there will feel her loss. 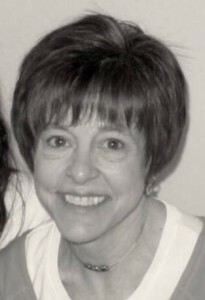 In addition, Pat leaves numerous paternal in-laws, nieces and nephews to cherish her memory. Pat was predeceased by her parents, Howard and Lydia Maier, and her dear grandson, Thomas Mueller. Pat was born on December 4th, 1948 in Philadelphia, Pennsylvania. She and her immediate and extended family spent many special summers on the Jersey Shore, and until Pat’s passing, her family and friends there remained a very special part of her life, especially her dear sister, Ginny. As a member of the Baptist church in her community, she applied for, and was accepted to attend the affiliated Bible College, North American Baptist College in Edmonton, Alberta, studying Business Administration at the young age of 17. It is here where she met, and with her beautiful brown eyes and forever welcoming smile, quickly stole the heart of her beloved and devoted husband, Peter. The two married on April 26th, 1969, and began a journey filled with love, adventure, joy, happiness, and a healthy dose of tears. They remained in Edmonton while Peter completed his schooling, and shortly after relocated to Medicine Hat to start a family. The connections that Pat and Peter established beginning at this time through their churches, communities, and places of employments had a lasting impact on both of them. Many of these relationships have lasted the years, which is testament to Pat’s sincerity and goodness. While raising her three children, Pat worked at various jobs, and her heart and sole remained focused on nurturing and providing for her children. As her kids grew, she eventually returned to work, and spent over 20 years within School District #76, with most of those years at her special school, CHHS, as a secretary and Students Records Clerk. In a professional setting, people referred to Pat as the ‘glue’ of the school; she was the sunshine greeting people at the start of their day; she was the twinkle that people came to visit throughout their busy schedules, and she was the loving, tender, and happy lady, who eagerly handed out not only smiles, but a generous handful of jujubes to whomever needed a little lift at the time. She loved people, and people easily loved Pat. Pat’s Mother was a gentle and loving woman, who loved life; she was dutiful, selfless, committed, while also being surprisingly playful, witty, sparkly, spunky, and fun. Pat adored her mother, and embodied all of these traits and more, and her children will proudly aspire to carry on her legacy with these remarkable qualities. A special place for Pat was her kitchen table, where she fed so many of us literally and metaphorically. People left Pat’s home full- full of her amazing food, and full of her warm and positive energy. Even at the most difficult of times, Pat still showed her family and her friends that life would simply be better if we all just made the best of whatever situation life had handed us. Her unwavering positive, generous, and earnest caring for others, without ever expecting anything in return, sum up Pat so beautifully. Pat had a bountiful supply of energy; as a runner, staying strong and healthy, as an entertainer, anticipating every need, and as a Grandmom, actively participating in her grandkids’ adventures. Pat’s sons-in-law and daughter-in-law continuously celebrated that they’d won the mother-in-law ‘jackpot’. She loved Di, Corey and Brett as though they were her own children. Pat’s accepting, trusting, and loving ways were what allowed the family to grow as close as they are. She was simply a natural; a natural Wife, Mom, Grandmom, and Friend. Genuine, generous. compassionate, and forgiving. Her husband remains in awe of her – she didn’t command attention, and yet people were drawn to her. She was fun. She was true. And she was an inspiration. She will be immensely missed. A thank you to the special nurses at Medicine Hat Regional Hospital who played an important part in Pat’s care, most notably Brent and Peggy. An additional thank you to Dr. Josh Foley and Dr. Doug Mastel, for their compassionate and committed care. In lieu of flowers, donations can be made to peloton65.com, a cause that was near to Pat’s heart. There will be a Celebration of Pat’s life on Saturday, November 9th from 3-5pm at Medalta Pottery (713 Medalta Ave SE, Medicine Hat). Guests are asked to dress comfortably, as though you were going for a visit at Pat’s house. Pat’s famous chocolate chip cookie recipe can be found here. This entry was posted in muellhorn by brett. Bookmark the permalink. A beautiful tribute. Thank you for sharing. My heart felt condolences to all. I just wanted to let you know my thoughts and prayers are with you and your family through this heartbreaking time. I wish I could gather the right words to make your pain less and offer you comfort. Just know I’m thinking of you all. Love to you and your family. Beautiful tribute, to a beautiful lady!! A very beautiful tribute to Pat, an amazing person who was on this earth for to short a time. Please know that our thoughts and prayers are with you through this very difficult time. What a beautiful tribute to Pat and your entire family. I know it is Pat’s strength that will help you through this painful time. I am fortunate to be able to call Pat my friend. My thoughts and prayers are with the family on the passing of a wonderful mother, grandmother, wife, and friend to many. Pat was a support to our family over the years at CHHS and also to my daughters. I will always remember her kindness and support she showed over the years. Thinking of her biological and professional families at this time. Beautiful as she was. She will be missed. Thinking of Peter and his family.. My deepest condolences to you all..
My earliest memories, at all, include Pat and your family. As far back as my mind’s eye can see, when I was really, really young, I can remember Pat’s warm smile while playing and doing little-kids stuff with Sara. Thankfully, I saw that smile and kindness for many more years when I attended CHHS. I feel lucky to have those memories as some of my earliest and I’m thinking about you guys right now – she was a great person. It’s touching to read this and remember Pat. I’m feeling very happy thinking of her warm smile and shining brown eyes. Thank you so much. Warm thoughts and care to your family, we will be thinking of you and remembering fondly. I remember first meeting Pat with lots of the family around. By the end of the evening, I adored her completely and felt deprived that I hadn’t known her for longer, much like I feel now. When it was time to leave, I was just about ready to give her a hug, but wasn’t totally sure if she would think that we were “there” yet. She must have caught some indication of my brief internal struggle, and didn’t wait even wait a nanosecond before her arms were as wide as her smile, welcoming me into one of her perfect hugs. She will be missed. I’m thankful she felt the love of the many great people in her life. What an amazing tribute to an amazing lady that I know I will long remember. I know that I have felt blessed that my path crossed with her path, even for just brief moments over the years. My thoughts and prayers will be with you in coming days and weeks. What a wonderful smile she had. It’s been over 20 years since I’ve seen it and the memories came flooding back when I saw the picture. I’m so sorry for your loss, and my thoughts and prayers are with you at this time. I’m very sorry for your loss. Patsy was a wonderful gentle and great person to be around. She really did remind me of her mother which is high praise. I can’t think of any gesture that would decrease any sadness or grief that you have. I was blessed by Pat’s kindness and I know she will be deeply missed. Thinking of your family. We remember Pat as a gentle, loving, kind and generous woman with a wonderful smile. We are so sorry for your loss and send our sincere condolences to you and all your family.